One element of heritage, particularly public manifestations of heritage, is that heritage is much more fun to do and to watch rather than to read-about. Most museums and historic sites will provide opportunities for visitors to touch, feel, and try particular activities from the past. Many will also incorporate forms of live interpretation and re-enactments, in order for visitors to see the past “come to life.” Certainly, these opportunities provide a much more diverse learning opportunity for visitors and provide a sensual, and perhaps empathetic, link between past and present. However, these kinds of activities are also enjoyable and make for an entertaining day out. Perhaps this is why forms of heritage events, such as the ubiquitous Renaissance Fair and Battle Re-enactments, are so popular. Of course, the forms and types of authenticity in these kinds of representations can vary. In my earlier life working at a pioneer village, we worked with several re-enactment groups, and while I found there was an intense fidelity to the accuracy of their outfits, there was little understanding – or care – of the broader social, cultural, and political issues of that material culture…or most anything else, really. At times, it was a cosplay, albeit with real or imagined educational overtones. At other times, I have seen re-enactment done very well, where it is entertaining, accurate, and informative. Sport heritage has been relatively slow to the re-enactment game, although this has been changing. 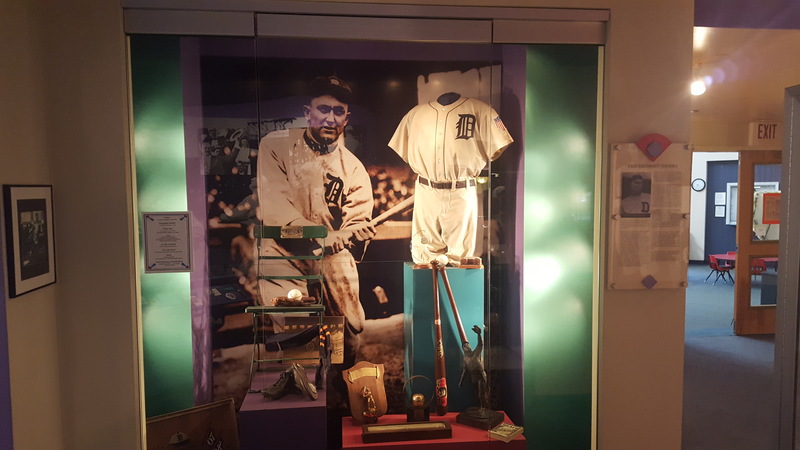 Certainly, sports museums employ interactive exhibits for a variety of reasons, from entertaining visitors to recruiting the next generation of athletes, though given the ludic nature of sport, it is surprising we have not seen more sites use more interpretation and re-enactments. Similarly, sport re-enactments and historical demonstrations may be akin to experimental archaeology, where historical sports are attempted to see how they work in time and space. However, there appears to be a rise in forms of sport heritage re-enactment and demonstration, particularly in the United States using early manifestations of baseball. It’s an intriguing slice of Americana. A blend of historical re-enactment and competitive endeavor, the game could be said to occupy something of a fraught intersection between where baseball was and where it is now…(T)he sport also counts hipsters in search of something off-mainstream, and conservative types attracted by a sense of nostalgia, a period when gentlemanly conduct pervaded the game. Even those who crave a scintilla of officialdom. Certainly, there are broader ideas – and ideals – of simplicity and something of the rural pastoral, which is indicative of many forms of heritage. The Guardian notes that there has been a significant rise in the number of teams in recent years, and while this could be simply the latest heritage/leisure trend, perhaps there is a larger issue going on – what Philip Moore calls “practical nostalgia” – whereby the nostalgic past becomes a roadmap for how to cure the ills of the present and future. Perhaps Vintage Base Ball is the latest antidote for coping with contemporary society. 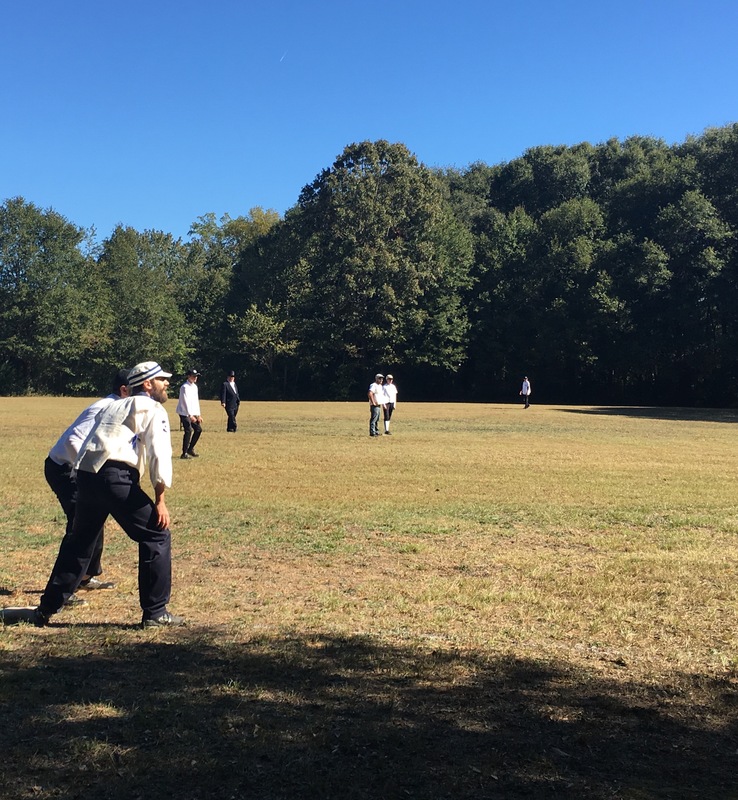 Earlier in October, I had the chance to actually play Vintage Base Ball as part of the Georgia Peaches – representing the Ty Cobb Museum in Royston, Georgia – as they took on the Shoeless Joes – representing the Shoeless Joe Jackson Museum in Greenville, South Carolina. The event is held each autumn, and the host museum flips back and forth (this year’s event was held in Royston). While many heritage-based events have goals related to awareness, or an attendance increase, or to raise funds, this annual event appears to exist simply to exist – that it is a way to celebrate, and perhaps redeem and rehabilitate, two of baseball’s infamous antiheroes: Joe Jackson, kicked out of baseball and banned from Hall of Fame induction, for allegedly being part of a group that fixed the 1919 World Series, and Ty Cobb, one of the game’s greatest players, but who might be most well-known for having an extremely short, violent, and possibly racist temper. Shoeless Joe has become a bit more of a folk hero in recent years, perhaps because of his link to the work of the late W.P. 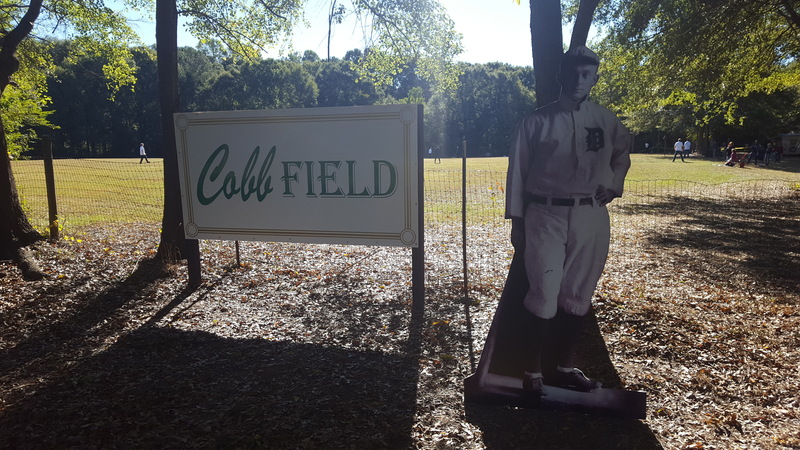 Kinsella and the film Field of Dreams, while Cobb – though still largely viewed in a negative light – has inspired recent scholarship that challenges much of the popular negative depiction of him. There is also an element of kinaesthetic learning to Vintage Base Ball. Like experimental archaeology, Vintage Base Ball could be considered a form of experimental sport heritage – trying a game from the past, in the present, and seeing how it works. I noticed that the game when relatively quickly – we played two games, in fact, and neither took more than 90 minutes or so. In part, it seemed that this had much to do with the rules, in particular that an out could be achieved from catching the ball after one hop (rather than in the air, as is the only way contemporary baseball). Similarly, you could see the echoes of cricket in the game, particularly in terms of fielding and style of play. Certainly, in the 1860s there was a transition from cricket to baseball, though beyond terminology and the lack of gloves, there is also an apparent shared yearning for a more civil form of recreation and leisure. Finally, although there was some fidelity to authentic representation (one player for the Georgia Peaches came all the way from St. Louis, and wore a vintage Detroit Tigers uniform for the game), it was more about celebrating the achievements of Cobb and Jackson, as well as creating a tradition in their name. By Gregory Ramshaw in baseball, event, heritage, history, local heritage, local history, museum, sport heritage, sport history, sport tourism, Uncategorized on November 1, 2016 .